It occurs in up to 20% of patients with cirrhosis of the liver and should be considered in anyone who develops difficulty breathing or shortness of breath. In 1992, researchers from the University of Florida published a report of a patient with hepatopulmonary syndrome who failed drug therapy, refused surgery, but improved while taking garlic supplements. Here’s the latest study from the Medical College Calcutta, in India. 41 patients with hepatopulmonary syndrome were randomly assigned to a treatment group and evaluated monthly for 9 to 18 months. The objective was to evaluate the effects of garlic on arterial blood gas parameters (lung function), and overall morbidity and mortality. 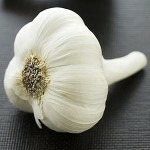 Lung function significantly improved during garlic therapy compared to placebo. After 9 months, garlic was associated with a 25% increase in baseline arterial oxygen levels (83 vs 67 mmHg) vs 7% increase (69 vs 64 mmHg) with placebo. Arterial oxygen is a measure of the ability to oxygenate blood — 80 to 100 mmHg is normal. A 28% decrease in alveolar-arterial oxygen gradient (A-a gradient; 21 vs 30 mmHg) with garlic vs 11% decrease (29 vs 33 mmHg) with placebo. A-a gradient measures the ability to transfer oxygen from the lung alveoli to arterial blood — a lower number is better. Reversal of hepatopulmonary syndrome was observed in 14 of 21 patients (66%) on garlic supplementation vs 1 of 20 patients (5%) on placebo. 2 of 21 patients undergoing garlic supplementation died during follow-up vs 7 of 20 patients taking placebo. This entry was posted on Wednesday, May 5th, 2010 at 12:08 PM	and is filed under COPD, Garlic, Liver Disease. You can follow any responses to this entry through the RSS 2.0 feed. You can leave a response, or trackback from your own site.